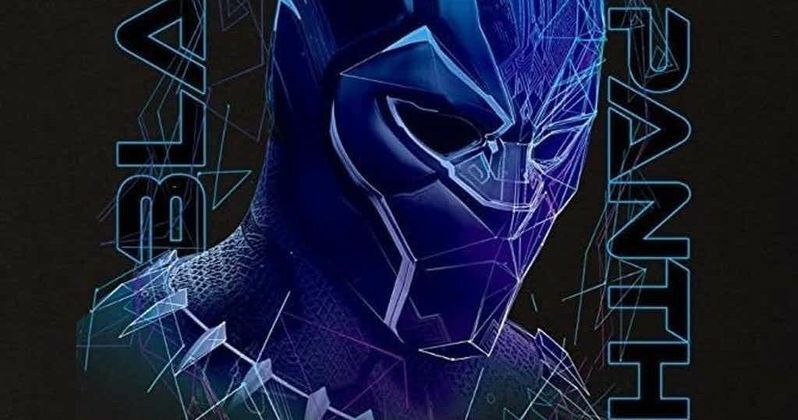 Some brand new promo art for Marvel's Black Panther has arrived online. There's a lot of comic book movie action coming our way in 2018, but Marvel's Black Panther is probably right behind, if not right on top of, Avengers: Infinity War, in terms of anticipation. Now, some brand new art for the movie has made its way online this is surprisingly colorful, but very cool and continues the hot streak for this movie's marketing campaign. These new Black Panther promo images lean heavily into the movie's lead character, T'Challa, as one might expect, but he's not totally alone. These colorful new promo images also include the Dora Milaje, Wakanda's female warriors, front-and-center. The marketing for Black Panther has not been shy about highlighting these warriors and it looks like they're poised to be a huge part of the movie. Nothing wrong with some more very strong, female comic book heroes on the big screen. Especially given the success of Wonder Woman this year. Black Panther picks up after the events of Captain America: Civil War and follows T'Challa (Chadwick Boseman) as he returns to his home as the new King of Wakanda, following his father's death. The isolated, technologically advanced, well-hidden African nation is threatened when a powerful old enemy returns unexpectedly. T'Challa's position as the new king is tested when he is brought into a conflict that puts the fate of his homeland and the entire world at risk. T'Challa must gather his allies and release the full power of Black Panther, the protector of Wakanda, to defeat these enemies and ensure the safety of his people. The cast for Black Panther is absolutely stacked. Marvel has assembled some great ensembles before, but this may take the cake. In addition to Chadwick Boseman as the titular hero, the cast also features Lupita Nyong'o as Nakia, Michael B. Jordan as Erik Killmonger, Danai Gurira as Okoye, Martin Freeman as Everett K. Ross, Daniel Kaluuya as W'kabi, Letitia Wright as Shuri, Winston Duke as M'baku, Angela Bassett as Ramonda, Forest Whitaker as Zuri and Andy Serkis as Ulysses Klaue. To ice the cake, Creed director Ryan Coogler is at the helm for Black Panther, which is set to arrive in theaters on February 16. Marvel Studios may not have been able to beat DC to the punch in getting a female-led superhero movie made in the modern age of comic book movies. However, Black Panther is the first to feature a black superhero at the center of it in the modern era and no comic book movie has ever featured a predominantly African-American cast. Diversity and totally unique imagery could make for something special next year. Be sure to check out the new Black Panther promo art, courtesy of the Marvel Studios Movies Twitter account, for yourself below.